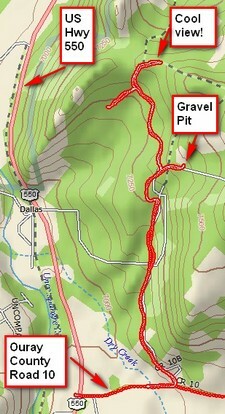 The red track shows the road up to the gravel pit. This evening I was wandering around back roads in Millionaire Valley and stumbled across a road I didn’t know existed. And it led to a great view! It turns out the road leads to a gravel pit—one completely out of sight from the main highway, in fact, out of sight from anywhere. The road is steep in places but is designed for trucks, so a motorcycle was no problem. Past the gravel pit, the road gets steeper and narrower. You can see that at the north end it forks. The western fork leads to a little hollow where some folks have some small trailer homes set up. The eastern fork gets real steep in a real hurry. I had to remember from last season how to climb steep hills (stand up vertically, meaning almost to the handlebars). But it was worth it for the view, taken where I turned around. From there the road heads up a very steep hill—more a bulldozer track than a road. I gave it a pass and will continue to. Up to the point where I took the picture below, any 4WD vehicle should do fine. UPDATE May 15, 2008: See video taken from this location. This photo, taken pointing nearly north from the "Cool View" point, provides a perspective on Ridgway Reservoir I've never seen before. That's US Hwy 550 down there. I spent much of my evening ride poking around County Roads 10 and 12, the main roads in Millionaire Valley. MV is the valley east of Highway 550 and a bit north of Ridgway. I also ventured up the road to Cow Creek. It’s mostly dry but badly rutted—some ruts six inches deep!—the ruts tended to grab the wheels. And, there were muddy spots—the kind of mud that clumps on the tires and makes for really squirrely riding! I’ll wait until June before trying the road again. I finish with a picture I took looking east from County Road 12. 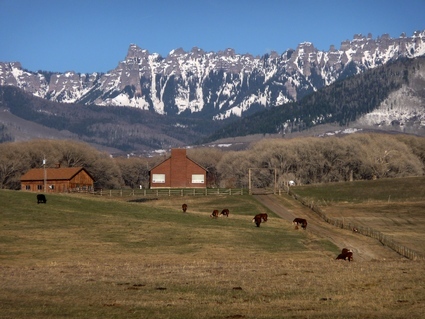 Millionaire Valley is known for its pastoral beauty. Those are the Cimarrrons up there.